Whether you just got started or have been in the game for a while, you’re probably hoping that your business or blog will perform better this year than it did last year. The thing is that you can’t just hope that your biz or blog will get more traffic, subscribers, leads, and sales. (These things don’t just fall out of the sky!) Instead, you have to implement the strategies that will help you take your brand to the next level. What kinds of changes should you make this year to crush your biz or blog goals? Here are 7 key ways to improve your business or blog. Want more traffic so you can get more subscribers, leads, and sales? Discover the power of Pinterest to grow your biz or blog. 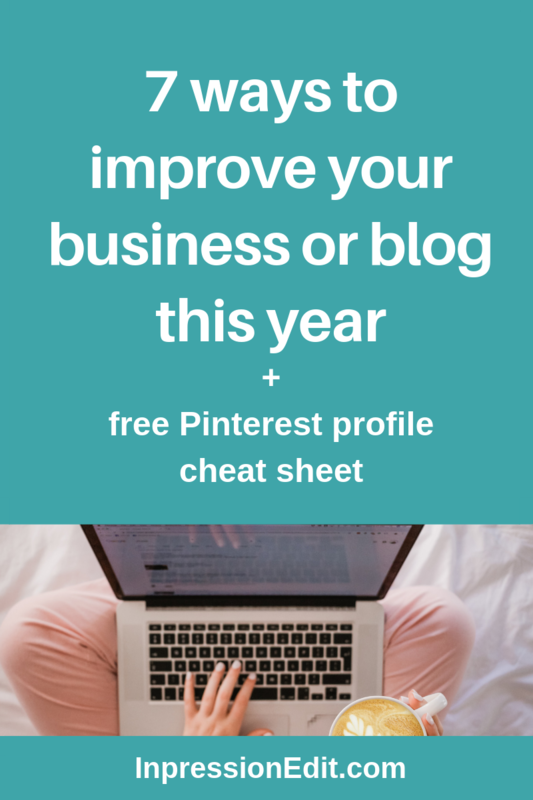 Get started today by grabbing my FREE Pinterest profile cheat sheet. Want to improve your business or blog by getting more subscribers, leads, and sales? The first thing you need to do is boost your website or blog traffic. After all, you can’t get people to sign up for your email list or buy your product if no one is visiting your website or blog in the first place. How the heck do you boost your daily website or blog traffic? Get serious about implementing my top 2 traffic-generating strategies: SEO and Pinterest. They account for about 65% of my website and blog traffic. And I wouldn’t be where I am today without them. The goal of SEO (or search engine optimization) is to optimize websites and blogs for search engines so that they show up in search engine results. 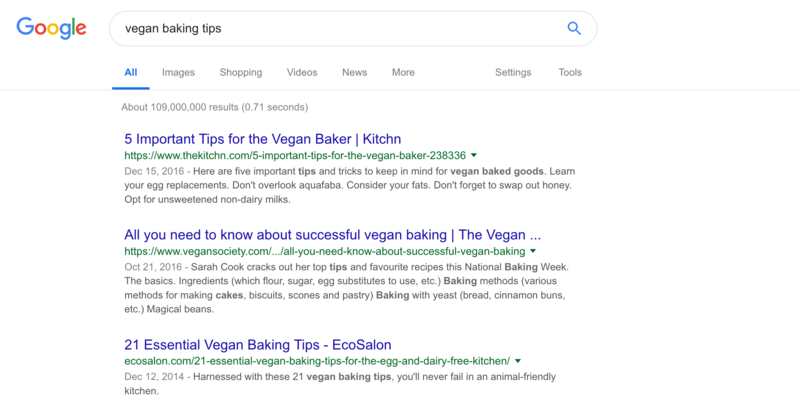 In other words, if I own a vegan bakery and I implement SEO on my website, it’ll help my site show up in Google and other search engines if people search for things related to vegan baking. Keep in mind that SEO is a long-term strategy because it can take several months for search engines to recognize the value your content offers. However, once you build up your SEO juice, you’ll find that SEO is one of the best ways to direct a steady stream of targeted traffic to your website or blog. After all, what’s better than getting the attention of someone who’s actively searching online for exactly what you do? The results you can get from SEO are totally worth the effort and wait. But is there something you can do in the meantime to get an initial traffic boost? There sure is, and it’s called Pinterest. If you’re skeptical about Pinterest, I totally get it. Even when I was hearing about all the amazing results people were getting from Pinterest, I thought it could never work for me. I mean, I’m a copywriter and content writer for crying out loud! Tight copy and content are essential if you want to improve your business or blog. But they don’t exactly make for the type of gorgeous eye candy that people usually associate with Pinterest pins. But I’m telling you that if you haven’t visited Pinterest lately, you’ve got to get on there and take a look around. Pinterest isn’t just for wedding planning, meal prep, and DIY home décor anymore. There are so many niches on there now, including many that aren’t inherently visual. And most importantly, they’re getting results! For example, when I started using Pinterest, my website and blog traffic grew exponentially. And as a result, my email list (which was my main focus) grew by 1018% in just one year! If you’re currently putting most of your energy into Facebook, Instagram, or Twitter, I encourage you to take Pinterest out for a test drive. Once I had been on Pinterest long enough to gain some momentum (about 3 months), it started giving me WAY more traffic than Instagram and Facebook combined. 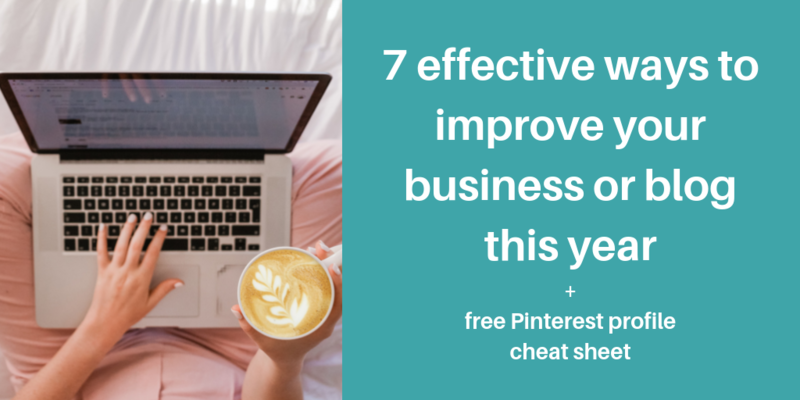 So if you want to improve your business or blog this year, I highly recommend giving Pinterest a try. Want to improve your business or blog by boosting your subscriber count or generating more leads? Create epic blog posts (or other content) that wow your audience and turn mere website or blog visitors into subscribers on your email list. You can have lots of traffic landing on your website or blog. But if you don’t give your audience a reason to stick around once they get there, they’ll bounce in the blink of an eye. How do you woo your audience and convince them that your website or blog is a key corner of the web they should visit again and again? Craft epic blog posts related to your niche. High-quality blog posts allow you to give your audience massive value before they’re ready to buy from you. They also allow you to demonstrate your expertise in your niche and convince your audience that you definitely know what you’re talking about. It doesn’t matter how new your brand is. One of the best ways to improve your business or blog this year is to build an email list that you can (eventually) sell to. Lots of people spend hours a week building a following on social media and barely pay any attention to their email list. But there are 2 key reasons why expert entrepreneurs and bloggers recommend prioritizing your list over social media. First, you don’t own your social media accounts. This means that Facebook or Instagram can delete them at any time. They can also launch an algorithm update that completely annihilates your reach (and your ability to communicate with your followers). With email, in comparison, you own your list. You can contact your subscribers at any time, and you won’t be out of luck if your email marketing provider goes out of business. Second, email converts better than social media does. Period. Let’s face it. At the end of the day, you’re #1 goal is probably to make more $$$. How can you improve your business or blog by boosting your sales? Strengthen your landing pages, calls to action, and email subject lines. Whether you’re selling a product or service to your website/blog visitors, social media followers, or email subscribers, you’ll need a landing page. A landing page is a webpage that’s designed to convince people to take a specific action. You can use a landing page to persuade people to sign up for a free resource or register for a free webinar. But if you’re trying to sell a product or service, you’ll use your landing page to make sales. Of course, it’s not enough to just have a landing page for your product or service. You need a landing page that convinces your audience that they would be crazy to pass on your offer. To maximize conversions, not only do you need strong, persuasive copy, but you also need the right design elements. Your landing pages are where you seal the deal on a sale. But to get to this point, you have to convince your audience to take several initial steps. For example, you might have to convince someone to click on your Instagram post, click on the link to your landing page in the Instagram post, and then click on your “buy” or “book” button on your landing page. How do you encourage your audience to successfully complete each step? By creating rock-solid calls to action (CTAs). 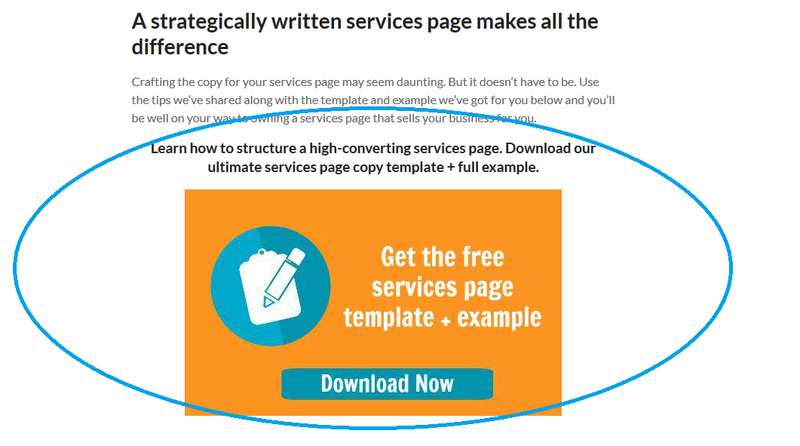 CTAs are essential components of blog posts, social media posts, marketing emails, landing pages, and other types of webpages. They tell your audience what you want them to do after they consume the copy they’re currently reading. And they convince them that it’s in their best interest to take this next step. 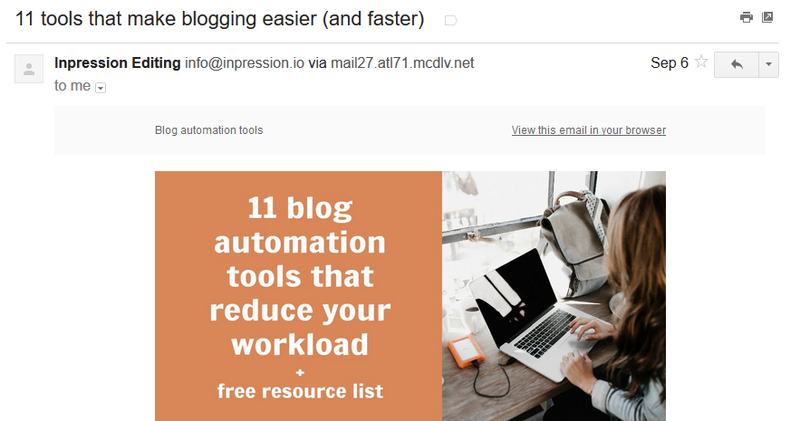 Your email list is a great tool to use if you want to improve your business or blog by making more sales. But if you want to use your email list to sell a product or service, you need to get your subscribers to open your emails in the first place. More than 1 in 3 people use an email’s subject line to decide whether to open it. This is why it’s *extremely* important to spend time crafting compelling email subject lines. No matter how busy you are, resist the urge to slap a half-baked subject line onto your email right before pressing “send.” Instead, give yourself enough time to write multiple potential subject lines for each email you write. This way, you’ll be able to put more thought into your subject lines and choose the best option from several alternatives. Blind vs. direct email subject lines: Which type should you use? Success isn’t like snow or bird poop. It doesn’t fall from the sky with no effort on your part. But this doesn’t mean that getting more traffic, subscribers, leads, and sales has to be hard. You totally have what it takes to improve your blog or business this year. (I know you do!) And the 7 strategies I’ve shared above will help you get there.